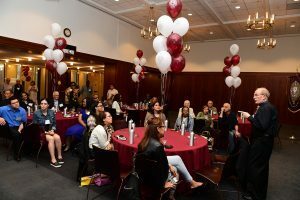 The final event of Fordham’s Dodransbicentennial celebration displayed a distinctly Manhattan flair on June 8, as approximately 700 alumni from five schools descended on the Lincoln Center campus for an evening of music, food, and good cheer. Befitting the campus’s proximity to a world renowned performing arts center, the evening’s festivities kicked off with a cabaret performance by Eric Yves Garcia, FCLC ’00, which brought together alumni from Fordham College at Lincoln Center (FCLC), the Graduate School of Social Service (GSS), Gabelli School of Business (GABELLI) graduate division, the Graduate School of Education (GSE), and the School of Professional and Continuing Studies (PCS). 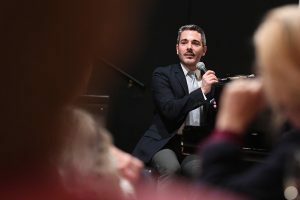 For Garcia, a graduate of Fordham’s theater program, playing cabaret standards on the piano in Pope Auditorium for an audience was a homecoming in the truest sense of the word, as he recalled sneaking into the space on many a late night to practice. When an acting career didn’t pan out upon graduation, Garcia said his musical talents enabled him to become successful professional cabaret performer. He said that performing works such as A Streetcar Named Desire and A Midsummer Night’s Dream as a Fordham student likewise influenced him today. 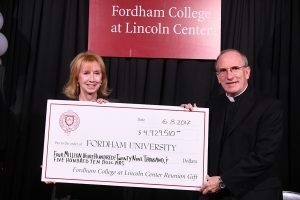 Patricia Dugan-Perlmuth, FCLC ‘79, presents the annual Fordham College at Lincoln Center reunion gift, which totaled $4,925,510 in this five-year reunion cycle. “Those plays are all old, but our professors impressed upon us that we had to invest in them vitality, and they weren’t museum pieces. You had to bring truth to them as best you could and work very hard to invest the words in them with meaning,” he said. 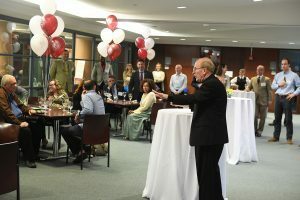 On the plaza level, Robert R. Grimes, S.J., dean of FCLC, marveled at the transformation that the campus has undergone in the last several years, which he attributed in part to the generosity of FCLC alumni. The college’s annual reunion gift, which totaled $4,925,510 in this five-year reunion cycle, was presented by Patricia Dugan-Perlmuth, FCLC ’79. Twelve floors up, Britanny Miller, GSE ’16, was rekindling the love she felt while working toward a master’s in education. A native of the Bronx who is now a school psychologist in New Rochelle, she said the University has a way of making New York City seem smaller than it is, because she frequently meets people who have connections to it. “I’m not this person that’s very courageous to speak out or introduce myself to new people, but something about the Fordham community really empowers me to do so,” she said. At the PCS reunion, newly appointed Dean Anthony Davidson, Ph.D., also alluded to Fordham’s place in the city. Father McShane addresses PCS alumni. In fact, Joseph M. McShane, S.J., president of Fordham, noted that earlier that day, a PCS yellow ribbon graduate spotted him at Reagan National Airport in Washington, D.C., as he was traveling back to New York. “There I was in in Washington . . . and I had the great fortune and grace to run into one of you. [The graduate] spoke with love and with great conviction not just about Fordham meant to him, but what Fordham did for him,” said Father McShane. At the GSS cocktail hour, Dean Debra McPhee, Ph.D., welcomed 70 alumni, the oldest of whom was Patricia Young, GSS ’62. The gathering got off to a slow start, a fact that Father McShane attributed to the likelihood that GSS alumni were so dedicated to their jobs that they were likely still working at 6:30 p.m. Jonathan Roque, GABELLI ‘11, a 2017 graduate of the GSS/GABELLI joint Nonprofit Leadership program, said he was heartened by his exhortation that students remember to care for themselves as well as their clients. He plans to use his degree to help his local church. 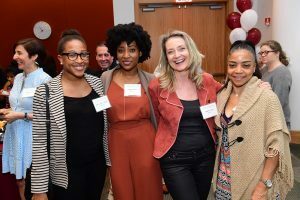 At the Gabelli School of Business’ graduate gathering, Tricia Schwerdtman, GABELLI ’16, said coming to Fordham was one of the best choices she’s ever made. A Sarah Lawrence College undergraduate who majored in poetry, she worked as a graduate assistant for Benjamin Cole, Ph.D., associate professor of management systems, served as president of the management consulting club, and now works at PricewaterhouseCoopers as a management consultant for financial effectiveness in health care. Working toward her degree strengthened her relationship with her father, too, she said. She recalled he’d made her dinner (macaroni and cheese) once when she was 7 years old, and pretty much never made meals beyond that. But that changed when she became the leader of a Fordham team participating in a case competition sponsored by the Association for Corporate Growth (ACG). “I came home from the ACG cup prep at three in the morning. He’d waited up, made me dinner, and said ‘You know, you got this. Eat and go to sleep,’” she said.